SON OF KONG trades on one outstanding moment that will haunt you forever. Trouble is, it takes five-thousand swishy B-movie moments to arrive there. The moment which almost erases all the shoddy filmmaking that comes before it, is in the film’s heart-breaking climax, when the Son of Kong desperately raises Denham above his head as floodwaters rise; Son’s foot is trapped, and he knows he will not escape the deluge, so he sacrifices his life to hold Denham aloft until the rescue boat reaches him. When Denham is lifted into the boat, the last thing we see in the raging storm is the bandage around Son’s finger – the bandage that Denham applied to win Son’s trust – as the waters close over him. Time stands still. Inconsolable weeping. We could never have guessed that the poorly executed schmaltzy moments that led to this scene were from the same movie! Such puerile acting, poor direction, shoddy writing, silly blocking and weak plot contrivances. Then this classic moment in cinema! Followed immediately by more schmaltz, in a blissfully unaware “romantic” coda where nary a thought is spared or a word said about Son’s ultimate sacrifice. Entrepreneur Carl Denham (Robert Armstrong, with an acting style that makes me want to beat him with my shoe until I vomit from exhaustion) is hiding out in a New York rooming house after his Kong debacle, dodging lawsuits, reporters and acting classes. He “runs into” the captain of the tramp steamer that took him to Skull Island (Frank Reicher reprising his role as Captain Englehorn The Credulous) and they attend a monkey show which also includes a young woman warbling annoyingly (Helen Mack as Hilda, in such extreme soft focus I almost slipped and fell in the kitchen). Hilda’s father, and owner of the monkey show, is killed by a guy (John Marston as Captain Nils Helstrom The Shifty) sent over from Obvious Villains, Inc. Through the convenience of “running into” one another, Denham, Helstrom, Englehorn and Hilda all set sail for Skull Island, Denham to escape lawsuits, Helstrom to escape the law, Hilda to escape her boredom and Englehorn to escape the plot. Turns out Helstrom is the man who gave the original Skull Island map to Denham… At this point, we seriously start questioning whether SON OF KONG was written by a first-year screenplay student submitting the first draft of her very first screenplay. Nope. It’s Ruth Rose, who co-penned KING KONG. Witness Helstrom saying to Denham, “When you brought back Kong, you surely brought the treasure,” and Denham’s eyes lighting up without any further evidence. Witness. And tell me this isn’t one of the worst constructed and contrived stories you’ve ever seen onscreen. Chinese Charlie the Cook is also onboard the steamer, still abusing the English language for Whitey’s racist pleasure. Mutiny. The five stars are thrown into a dinghy at sea – and they STILL find Skull Island. When they arrive, extras in black body paint and afro wigs greet them, with Capt Englehorn hilariously translating gibberish. Looking for this “treasure,” Englehorn, Helstrom and Charlie go in one direction, while Denham and Hilda find a 12-foot tall white gorilla trapped in quicksand, and Denham immediately says something stupid, “Why, it’s a little Kong! I didn’t know Kong had a son!” How nice of you to ASSUME it’s a blood relative. He exhibits the demeanor of a baby, mumbling little bloops and chimp-like whines, and scratching his head in wonder, so Denham calls him Little Kong, but I refuse to call him by his Whitey Demon name. I choose to call him Timbu. He looks like a Timbu, right? 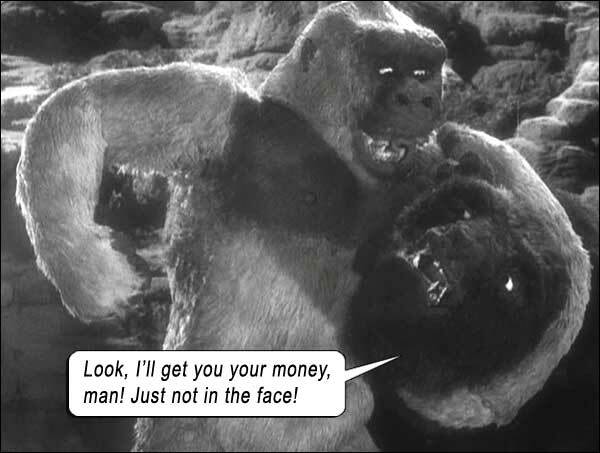 Just as the same cast and crew returned, so did the same effects maven – Willis O’Brien, Kong’s creator and stop-motion animator – to create and animate Timbu. Meanwhile, a styracosaur is busy chasing the other idiots into a cave. A herbivore chasing men and trying to rout them from a cave. Sounds sensible. Denham bandages Timbu’s cut finger. It would prove the most poignant act in the movie, as we see in the finale. With his awesome strength, Timbu keeps helping them with little tasks, including finding Helstrom’s vaunted treasure, until the other idiots reunite with them. And then the island explodes. Must have been nice in those days not to have to write a second draft of the screenplay even when the first one made no sense. During the deluge of the island, Helstrom gets his, devoured by a sea serpent. Like I said, first drafts don’t have to make any sense. You will cry a river of tears in that finale, when Timbu sinks beneath the waves having saved Denham. We figure Denham must be drowning in guilt now: he blames himself for getting Kong killed (which is absolutely correct, by the way! ); now he thinks this is Kong’s son, leading him up a mountain to safety as the waters rise, and in trying to save Denham, Timbu’s foot is caught in the rocks, which Denham can’t dislodge no matter his efforts – meaning that in Denham’s mind, he also killed Kong’s son! But no! In the filmmakers’ eyes, Denham’s bandaging of Timbu’s finger was absolution enough for his part in killing the eighth wonder of the world. This story, like KONG, is another tragedy! There is not one mention of Timbu, not one inkling of comprehension of the gravity of his sacrifice, not one smidgen of guilt exhibited by Denham, not even a passing thought of, “If it weren’t for that ape, we wouldn’t be this happy now…” NOTHING! Movie completely misses its opportunity to shine. We don’t need any more evidence that these filmmakers just DON’T GET IT, and they hit the mark by accident with that one scene. Stop all the Kong reboots. Someone needs to remake this emotional film – I’m looking at you, Mr. Jackson – with modern tech, actual acting, well-written story, and all the missing emotion that these filmmakers had no clue how to access. Then it would truly be worthy of being called SON OF KONG. Starring: Robert Armstrong, Helen Mack, Frank Reicher, John Marston, Victor Wong, Ed Brady.